The stark contrast in the approach to the long-running North-South crisis, plagued with political and military confrontations, is seen clearly in the “S.J.V. Chelvanayakam Memorial lecture” delivered by Dr. Rajitha Senaratne, Minister of Health, on 26th April 2017. In it he lauds “Chelva”, the Father of Tamil separatism, to stratospheric heights as if he was the God-granted saviour of the Tamils and, by extension, the nation as well. 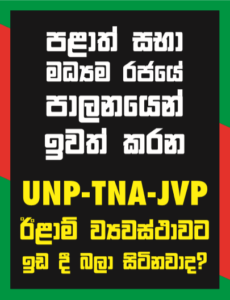 His objective undoubtedly is to win Tamil votes and keep the TNA within the UNP fold. But the persistent counter moves pursued by V. Wigneswaran to demonise the Sinhala leaders has undermined the goodwill that Dr. Senaratne hopes to achieve. “Wiggs” has been using his official position as Chief Minister of the Northern Province to generate hate against the Sinhalese by denigrating and condemning all Sinhala leaders, from D. S. Senanayake to Mahinda Rajapaksa, as genocidal exterminators of Tamils. It would have enhanced his image if his accusations were based on historical realities. But then, as the informed community is aware, writing political fiction to demonise the Sinhala-Buddhists has been the permanent occupation of Tamil leaders and their agents in the South from colonial days. The hostile reaction of “Wiggs” is in keeping with the Tamil tradition of demonising the Sinhala South at every turn. From the Northern perspective, anti-Sinhala-Buddhist politics has always enabled the Vellala leaders to pose as the defenders of Tamil rights, protecting them from “the Sinhala enemies.” But there is a hidden agenda to this anti-Sinhala-Buddhist politics of the Vellalas – the dominant masters of Jaffna who invariably determined the course of Tamil politics. It was they who defined, programmed and implemented peninsular politics at all times. And their strategy was to define the Sinhala-Buddhists as their bogeyman. Their calculated strategy of accusing the Sinhala majority of discriminating against the minority has succeeded not because it is true but because it has been repeated ad nauseam over the years..
Demonising the Sinhala south gave them political mileage which the most advanced advertising agency could not program. With that they managed to gain global political sympathy as victims of majoritarianism. But there is a contradiction in this. Available statistic prove that they have been the most privileged community in Sri Lanka when they were claiming to be the victims of discrimination by the majority. This cry was first raised by G. G. Ponnambalam in his ten-hour lecture to the Soulbury Commission in the late thirties. The Commissioners dismissed it as unsubstantiated propaganda. Later, of course, there were missteps which contributed to worsening of the North-South relations. Despite the infirmities which affected all three communities – Tamils, Muslims and Indian Tamils – only the Jaffna Tamils took to violence. Why? If the majority Sinhalese were that bad against the Tamil-speaking minorities how did the Tamil-speaking Muslims and Indian Tamils manage to co-exist peacefully with the majority? The accusations against the majority by the Tamil minority evaporate when only they refused to co-exist peacefully. If two of the minorities could resolve their difference non-violently, within the democratic framework, why did only the Vellala Tamils of North fail? Obviously, the Vellala Tamil agenda would have gone way beyond that of the other two communities who did not resort to violence. The failure to rope in all the Tamil-speaking people into the Vellala agenda was a deadly blow to their claims of victimology. Besides, they had to swallow their pride when their strategy eventually boomeranged on them. The very forces they unleashed to beat the Sinhalese turned against them. First, the anti-Sinhala-Buddhist campaigns painted the Vellalas into a corner from which they couldn’t get out. The more they demonised the Sinhala-Buddhist the more they were forced to withdraw into the extreme end of aggressive politics. And finally when they unleashed the Vadukoddian “boys” to beat the Sinhalese, they turned against the Vellalas and annihilated the leadership that fathered the Vadukoddai Resolution. The plus factor to the Vellalas, however, was that the more they took to the extreme racism the more they were able to tighten the grip on Jaffna as the saviours of Tamils. This, in short, is the history of post-independent era. It a history that flowed from provocative and arrogant politics of G. G. Ponnambalam, and his successor S. J. Chelvanayakam. They were the two decisive figures who laid the foundations for peninsular politics and both of them took Jaffna, in stages, to the extreme end of the racist spectrum. But their roles, as Vellala leaders, were portrayed as defenders of Tamil “nationalism”— a fiction which popped up in the minds of Tamils in the late fifties when they were looking for an excuse to justify Tamil extremism. For instance, both shot into the limelight raising cries of “discrimination” and not “nationalism”. The thirties and the forties were the years when massive tidal waves of anti-imperialistic passions were sweeping the globe. Neither of the Tamil leaders raised a nationalistic cry then. “GG” cried for “50 – 50” in the thirties and “SJV” cried for federalism in the forties. Both rose to power and held power in Jaffna on the support of the English-speaking Vellalas, mainly in government service, who dominated peninsular politics. “On the whole,” wrote Prof. A. J. Wilson, son-in law of S. J. V. Chelvanayakam, “the Tamil vellalashave dominated government service and the professions, with the occasional member from minority castes,” (p. 140 — S. J. V. Chelvanayakam and the Crisis of Sri Lankan Tamil Nationalism, 1947 – 1977, A political Biography, A. J. Wilson, Lake House Bookshop, 1993). Both leaders banked on this group of Vellala public servants to launch and promote their Jaffna-centric politics. They were also dependent on the Vellala villagers who dominated the electorates in Jaffna..Besides, both leaders represented Vellala interests and not that of all the Tamils, most of whom were excluded as pariahs. The omission of the critical role played by the Vellalas has distorted the main perspectives of national politics, leading to a one-eyed view of blaming only the Sinhala south. It resulted in a mono-causal view which exonerated the Vellalas from any responsibilities of directing Jaffna politics into the hell-hole in Nandikadal. Consequently, national politics has been projected as if there was only one-way traffic with Yal Devi going up North and never coming down to the South. The unrelenting flow of Northern forces coming down to bedevil national politics was hardly drawn to explain the division of the nation into two hostile camps. It was, as if the Vellalas, the over-determining force in Northern politics, were non-existent, or only a negligible factor. They were hiding behind the mask of being Tamils to claim the status of a minority oppressed by the majority Sinhalese. Furthermore, their upbringing and their casteist environment made them prisoners of Vellala interests only. Their arrogance and superiority complex also provided no space for anything other than Vellalaism in Jaffna. The grim realities, as depicted by K. Daniel in his classic novel, Kanal, confirm that the sole factor that determined Jaffna culture was Vellalaism. Daniel dramatically exposed how the Vellalas lived their separate lives, keeping the other half away from the temples, schools, farms, churches, buses, etc. The Vellalas even dictated to the low-castes how they should conduct their weddings and funerals. If they violated the Vellala customs and laws they were beaten,sometimes to death. They would not share a drop of water with the low-castes or allow them to walk in daylight in case they polluted the pure eyes of the Vellalas. With the Vellalas suppressing and excluding the “other” there was no space for the other half to play a role in peninsular politics. The Jaffna culture was structured from feudal times to hand over supremacy only to the Vellalas. Consequently, there was only one player in peninsular politics : the Vellalas.It was the Vellala factor that steered peninsular and national politics. Yet this over-determining factor is missing in the analyses of Northern political landscape. Sweeping the critical role played by the Vellalas under the carpet gave the upper hand to the Vellalas to hide their obscene casteist politics. They needed ideological masks because they could not operate, either inside Jaffna or outside, as a casteist force. Not in modern times. They could win respectability and integrity only if they shifted to a more acceptable and broader brand name known as the Tamils. They were, of course, proud to be Vellalas in feudal and colonial times. But they could not survive as Vellalas in modern times. They were equally proud to proclaim their status as Vellalas inside Jaffna. But when they came out of the peninsular and moved into the civilised world they declared themselves to be Tamils. They played the roles of Dr. Jekyll and Mr. Hide craftily depending on which face would help them to extract the maximum political advantage to retain / expand their power and privileges. So from time to time they changed their masks. For instance in London they could not claim to be Vellalas, except among themselves, because the English would have no sympathy for oppressive caste-masters. In London they would pose as Tamils oppressed by the Sinhalese. In short, their geographical location determined their identity. This explains why the Vellalas have been operating under the smokescreen of Tamils which has no relevance to the realities of Jaffna politics. The Vellalas and the Tamils were two different communities put together by force of circumstances in the gulag of Jaffna. The absence of this factor is the fundamental flaw in the political analyses of Sri Lankan politics. Their critical role has been disguised and passed off as Tamils though they would not have bar of being one with the Tamils living outside their caste fence. The fact is that there was no Tamils politics, encompassing all layers of Jaffna society. There was only Vellala politics. And it was their politics that dragged Jaffna all the way from the first communal riots provoked by “GG” in Navalapitiya in 1939 to Battekotte (Vadukoddai in Tamil) Resolution in 1976 and then finally to Nandikadal. It was the Vellalas who determined the destiny of Jaffna every step of the way, from feudal and colonial times to the end of their “boys”, led by Velupillai Prabhakaran, the first-born child of the Vellala Battekotte Resolution. Yes, of course, the Vellalas were Tamils at birth but as adults were the Vellalas for the Tamils whom they oppressed during feudal and colonial times? Throughout their history they fought the low-castes tooth and nail to maintain their supremacy by oppressing their fellow-Tamils. The caste factor was so ingrained in their genes that at one stage they were willing to join hands with the Sinhala Goigamas to maintain their supremacy over the low-caste Tamils. Their hatred of the Tamil low-castes was so great that they held talks with the Sinhala Goigamas (the equivalent of Vellalas of the north) to form political alliances. “In fact,” wrote Wilson, “during these years (1920s) there was discussion in certain influential Tamil circles about the possibility of a political alliance between the Sinhalese Goyigama and their Ceylon Tamil vellalacounterparts. Such a view was seriously put forward at a closed meeting of Ceylon Tamils held at the Colombo town Hall in 1954. These Ceylon Tamils hoped to trade on the contempt that some of the influential Goyigama politicians had for the Karawas. / There continued vague prospects of Goyigama – Vellala partnership when sections of the Ceylon Tamil political elites, after independence , cooperated with the Goyigama-oriented United National Party governments (1948 – 1956). Ceylon Tamils held important portfolios relating to trade commerce, industries, industrial research and fisheries and housing in these governments.(pp. 466 – 467 – Race, Religion, Language and Caste in the Subnationalisms of Sri Lanka, A Jeyaratnam Wilson in Collective Identities Nationalism and Protest in Modern Sri Lanka, Marga Institute, 1979). Clearly, the Vellalas were a serious threat to the Tamils as well as the other communities. This omission of the critical role played by the Vellalas has been the missing link in analysing national politics. It is their self-serving, aggressive politics that pushed the national agenda too. In short, national politics would not have been pushed into military confrontations if there were only Tamils, as seen in the case of the other two communities, the Muslims and the Indian Tamils. It is the Vellalas who manufactured anti-Sinhala-Buddhist venom, in the name of protecting the Tamils, to poison the Jaffna landscape. The other two communities managed to resolve their difference without violent confrontations. So why did only the Jaffna fail to co-exist peacefully, despite resolving the major “grievances” with which they launched their anti-Sinhala-Buddhist campaigns? Historical records establish that it is the provocative Vellala leadership that intransigently and implacably dragged Jaffna in the pre-and-post independent era to military confrontations. And they paid for their folly with the annihilation of the Vellala fathers who passed the Battekotte Resolution. Throughout their post-independent campaigns they cunningly manipulated their propaganda to present themselves as the saviours of the Tamils. The international community too was made to believe that at the core of the North-South conflict was a majority-minority issue. There was no concerted or intelligent campaign to challenge the myths of the Vellalas – the most privileged community in Sri Lanka – posing as the oppressed minority. The Vellalas still survive globally on this myth of victimology. If the fiction of discriminating against minorities is such a dominant and deeply divisive factor how come the other two communities refused to join the Vellalas? In fact, “SJV” launched his iyakkam (movement) of the Thamil Payasoom Makkal ( Tamil-speaking people) to form a common front but it failed to take off the ground. Why? Obviously, there was no common agreement about “discrimination” by the “Sinhala state” among the Tamil-speaking people. Consequently, only one minority – i.e. the Vellala Tamils – refused to co-exist with the majority on the grounds of “discrimination”? And they got away with their myth of victimology, mainly because our so-called intellectuals refused / failed to analyse the underlying issues objectively. Our intellectual and academic mytho-maniacs too joined the bandwagon to promote and substantiate the Vellala fictions of victimology. The result was to project the Vellalas oppressors as the saviours of the Tamils. This Cyclopian view distorted the main perspectives of national politics, leading to the one-eyed accusation of blaming only the Sinhala south. It resulted in a mono-causal view which exonerated the Vellalas who consistently drove Northern politics to mono-ethnic extremism by demonising the Sinhala-Buddhists as their implacable enemies. P.S. : Please note that this article is based on Tamil sources all of whom are respected authorities on peninsular politics. Critics should argue against them if they disagree.